(Syracuse)  State University of New York College of Environmental Science and Forestry (SUNY-ESF) graduate students Jessica Martin (Little Falls, N.Y.) and Alvin Chan (Plattsburgh, N.Y.) are part of a year-long septic system monitoring project being conducted by the Catskill Watershed Corporation at 24 sites* within the New York City watershed in the Catskills and Delaware Region of New York State. Many residential properties in the Catskills are insufficient for conventional onsite systems due to poor soils, small size, proximity to watercourses, high groundwater or steep slopes. 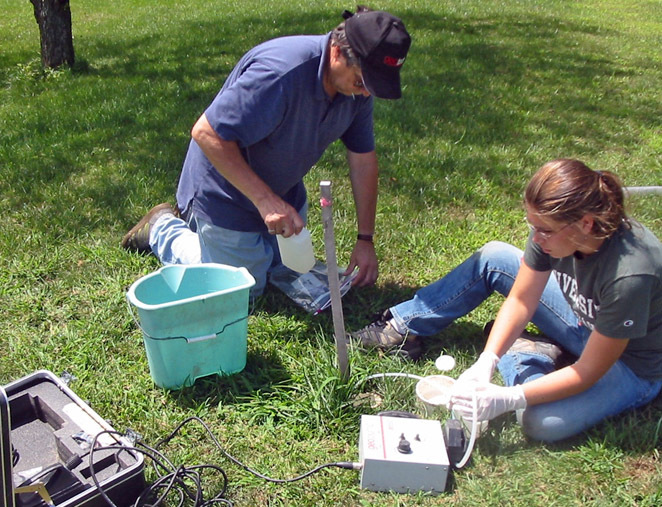 The CWC Septic Monitoring Program is investigating the use of the best available technology for long-term on-site wastewater treatment under less than optimum conditions. 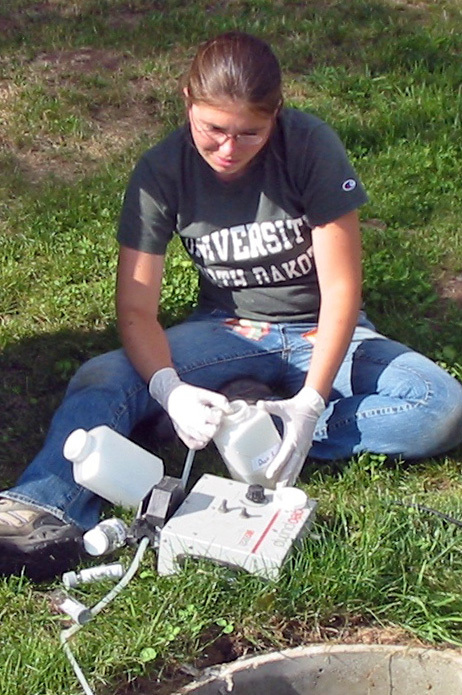 This research project is funded in part by federal Safe Drinking Water Act monies administered through the New York State Department of Environmental Conservation. The SUNY College of Environmental Science and Forestry (ESF) is acting as consultant to CWC during the field testing period. The project involves installation of several alternative technologies, which will be monitored to determine which works best. "We're checking septic fields for evidence of poor water quality that could be leaching into the groundwater and then into the water supply," said Martin. She explained that two pumps are used at each of the 24 test sites. One is an electric pump to collect the samples in bottles and the other is a hand pump to pump the wells dry so the water volume can be measured. Samples will be taken every month over a year's time. "So far so good," said Chan, "Some (sampling locations) have been dry so we don't have samples yet from them while others have been overflowing but we haven't had any problems collecting the samples needed to begin our analysis." The project director is Dr. James Hassett, Professor and Chair, Faculty of Environmental Resources and Forest Engineering, SUNY-ESF. He is responsible for overall project management and development of the final report. Dr. Donald Seigel, Professor, Department of Earth Sciences, Syracuse University is one co-director assisting in site investigations, determining groundwater flow systems and data analysis while Dr. Theodore Endreny, Assistant Professor, Faculty of Environmental Resources and Forest Engineering, SUNY-ESF, is the other co-director assisting with maps of the sites and predicting the effects of on-site systems to larger scale. The Catskill Watershed Corporation was established to protect the water resources of the NYC watershed west of the Hudson River. 90% of the 1.3 billion gallons of water consumed by 9 million residents of NYC and its suburbs comes from 6 reservoirs in the five-county Catskill Mountain/Delaware River region of New York State. *Test sites are located in Jewett, Prattsville, Windham, Andes, Woodstock, Hamden, Delancey, Shandaken, Phoencia, Walton, Delhi, Bearsville, Stamford, Hobart, Roxbury, Grand Gorge, Lexington, Middletown, Fleischmanns, Ashland, East Jewett, Kortright, East Kortright, and Neversink.